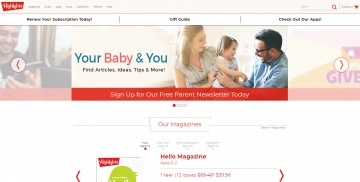 Highlights offers children's magazines, book clubs and gifts for ages 0-12 that nourish children’s minds and hearts. Kids from 0-12 enjoy Highlights brand products. $8 Cash Back on Clubs. Cash Back is only available on magazine subscriptions and Clubs. Cash Back is not available on free trials. Click a Coupon or click Start Shopping to earn Up to 12% Cash Back at Highlights.